One of the specific traits of the human species is the ability to manipulate others to benefit from it. Deception and manipulation are considered negatively by the majority of the cultures but in reality, everyone experiences mendacity to some extent, especially when interacting in social situations with others. This study focuses on deception in a social context, when the individual keeps his true opinion private in order to comply with the one shared by the group. The experiment tested whether social conformity operationalized through social approval score and cultural background, affects the individual’s tendency to lie in social situations. To this end, participants were asked using vignettes (i.e. hypothetical situations) how likely they would have lied in that specific social situation. The situations described were manipulated in their context, meaning some factors were changed to foster a high social conformity or a neutral reaction. Secondly, because the experiment investigated also how the level of social conformity of the participants interacted with the cognitive effort necessary to lie, it also measured reaction times (i.e. how long it took participants to fill out the vignettes questions). The study’s results demonstrated how the individual propensity to conform had a stronger influence on the tendency to lie of an individual, compared to his cultural level of social conformity. Therefore, the social approval score was used to split the subjects in low and high conformists. Afterwards, the analysis revealed how high conformist people were more inclined to lie in social situations compared to non-conformists, independently from the context of the social situation. 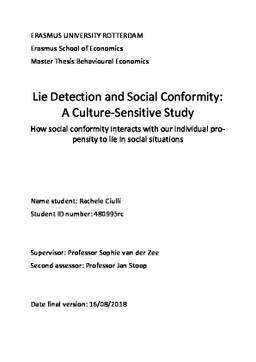 In fact, the manipulation of the context to trigger social conformity did not play a role in how social conformity affected the subjects’ tendency to lie. An analysis of the reaction times showed how the high conformist subjects were faster than low conformists in deciding with which probability they would have lied in a certain situation. These results showed how the propensity and desire to conform of each individual, being a strong and personal characteristic, is able to influence his tendency to lie and the intensity of cognitive effort necessary to lie. Adding important insights to the discussion on the cultural influence of dishonesty on individual deception, the study showed how external factors as the cultural background of the subjects and the context of the social situations in which they interacted did not play a role in the influence.